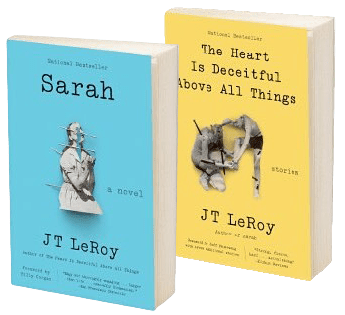 Click on these titles for the UK editions from Little Brown of Sarah and The Heart Is Deceitful Above All Things. Below are the American editions from HarperCollins. Find the books in your favorite format by clicking here. 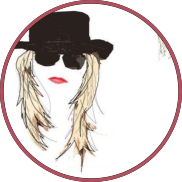 A reissue of the national bestselling novel by JT LeRoy/Laura Albert—published to coincide with the new Jeff Feuerzeig documentary: Author: The JT LeRoy Story, which will have a theatrical release in September 2016. Sarah never admits that she’s his mother, but the beautiful boy has watched her survive as a “lot lizard”: a prostitute working the West Virginia truck stops. Desperate to win her love, he decides to surpass her as the best and most famous lot lizard ever. With his own leather mini-skirt and a makeup bag that closes with Velcro, the young “Cherry Vanilla” embarks on a journey through the Appalachian wilds, dining on transcendental cuisine, supplicating to the mystical Jackalope, encountering the most terrifying of pimps, walking on water, being venerated as an innocent girl saint—and then being denounced as the devil. By turns exhilarating and shocking, magical and realistic, Sarah brings urgency, wit, and imagination to an unknown and unforgettable world. This book of interconnected stories depicts the chaotic life of a young boy on the run with his teenage mother. When Sarah reclaims Jeremiah from his foster parents, he finds himself catapulted into her world of motels and truck stops, exposed to the abusive, exploitative men she encounters. As he learns to survive in this harrowing environment, Jeremiah also learns to love his mother, even as she descends into drug-fueled madness. Told in spare, lyrical prose, rich with imagination and dark humor, The Heart Is Deceitful Above All Things transforms the savagery of Jeremiah’s world into an indelible experience of compassion. This special edition includes an additional seven stories, previously uncollected. The beautiful new covers were designed by Adalis Martinez; they feature Collage Art by Najeebah Al-Ghadban – see more of her work here and on Instagram and Tumblr.